The bumper crop this year was a celebration. 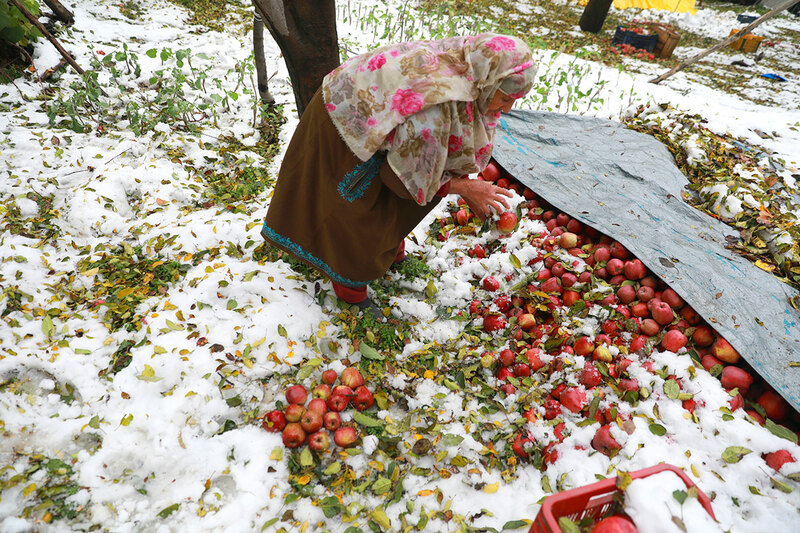 For the apple growers of Kashmir, however, the increased freight and the stagnation in the rates – within and outside fruit market – was the real worry. Still, the show was on. 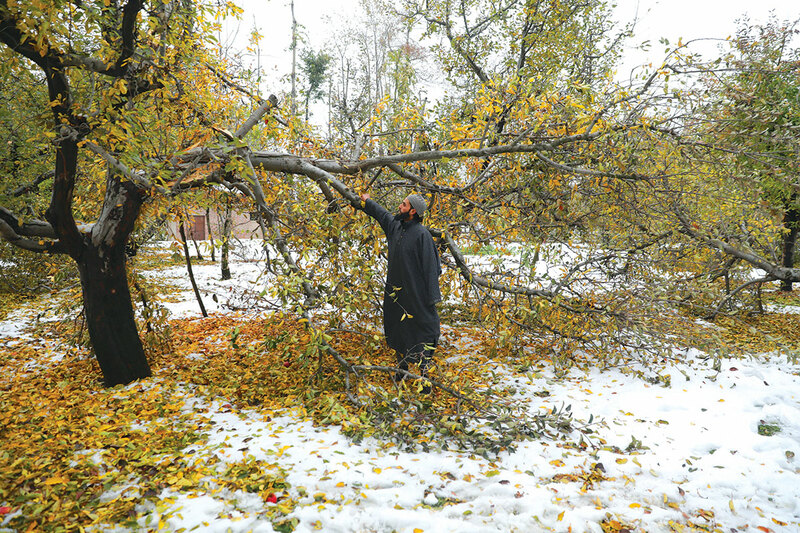 Then came the weather conditions that brought instant wet snow, and within a few hours, during the night of November 3, it led to the literal culling of the vast orchard space across Kashmir. The snowfall that was almost uniform from Kahnabal to Khadanyar, brought Kashmir into an instant mourning. 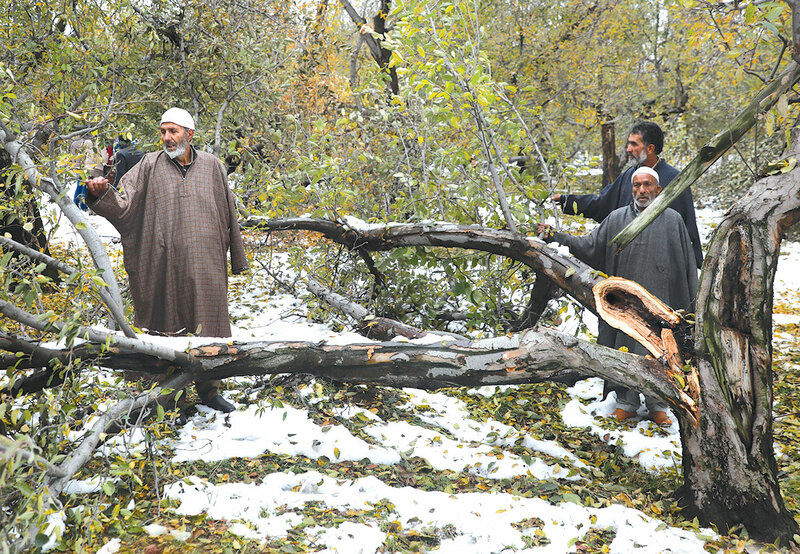 “It was heartbreaking,” Sheikh Ashiq, the president of Kashmir Chamber of Commerce and Industry (KCCI), who drove his team to see the catastrophe in the south Kashmir orchards, said. “I saw the trees uprooted, broken in four parts from the trunk, and the frustration of the growers in managing the loss.” They visited the entire south and interacted with the trade in the mundis as well. Many people in Kashmir insist that the crop insurance that was only hawked for many years and not effectively extended could have been helpful. But the problem is that snow and hailstorm have rarely been included in the crop insurance. “We did suggest them that if the government is serious about the belated introduction, they must take care of the visible and clear discrepancies that the policy envisages,” Ashiq said. Since the people are busy in repairing the orchards, the routine autumn pruning has gone to the back seat. This, if not done quickly, can add to the crisis in coming winter. Governor Satya Pal Malik’s administration was quick in response. Overnight, one of his adviser’s was seen leading a team of officials to the orchards and demonstrating the technique that the growers must follow. The overactive Chief Secretary BVR Subramanyam quickly followed with his bureaucracy and the status of the crisis was upgraded to State Specific Special Natural Calamity. This was precisely done for purpose of providing additional assistance to the affected farmers from the State Disaster Relief Fund (SDRF). The enhanced relief will now be Rs 36,000 per hectare which is Rs 1800 per kanal of an orchard. Although part of the relief has been transferred to the Deputy Commissioners, the survey is still in progress and will take some time. The relief per kanal would not even help growers manage the two days of labour or the basic requirement of repairs. But the government’s systemic and systematic failure in understanding the market beyond the salaries of its staff is something that lawmakers will eventually have to look into. The snowfall led to two types of loss: the crop loss and the loss to the trees. When Khursheed A Ganai, an adviser to the governor, visited Islamabad, the Deputy Commissioner shocked him by saying that the district has lost 1.5 million apple trees! Apple is not an ordinary fruit. For Kashmir, it is directly linked to the economics of the place. For all those who are not employed in the government, both state and the centre, apple is the primary source of income. This Rs 6000 crore plus the economy is the key player in the economic stability of a conflict-ridden demography that spends more time in protest and mourning than work. Somehow, agriculture has skipped the harsh discipline that usually rules the streets. It literally took ages for the system to understand the significance of the apple in Kashmir economy. Once it happened, the seriousness followed. A series of decision making in the sector indicated the importance the systems bestowed on it with active cooperation from the socio-business community. Firstly, it took almost two decades for the government to introduce the cardboard box. Efforts failed, year after year, and finally, one farmer discovered the importance of it. Once the word of mouth spread, the cardboard box manufacturers in Jammu worked round the clock to keep the supply going. Now a few units operate from Kashmir too. Though the wooden box is still in vogue, a huge quantity uses the cardboard. Secondly, the government initiated a revolutionary step and withdrew the toll tax on fruit ‘exports’. As part of the pathetic thought process, Jammu and Kashmir was taxing its own produce for decades going against the basic norms of economics. Thirdly, the change helped the growers as banks understood the importance of apple and reviewed the schemes thus increasing the ticket-size to four times in the initial upgrade. They also added traders to the grower –exclusive scheme and JK Bank played the fundamental role. Though the scheme is still the flagship intervention of the JK Bank, it has indirectly helped reduce the dependence of the growers on the commission agents. Right now, apple financing forms the major component of the Rs 7444.27 crore agricultural advances across the state, mostly in Kashmir. In comparison to fiscal 2017, the growth in agriculture advances was 7.2 per cent. Fourthly, the government introduced the Market Intervention Scheme (MIS) envisaging a support price for the entrepreneurs to purchase the c-class fruit and convert it into juice and apple concentrate. Limitation of allocations and the abysmal rate structure, however, has not helped the intervention to lead to the making of a chain of plants. Quite a few, however, are working. Officials said they procured 3982.595 tons in 2017-18. Fifthly, the government created a chain of fruit markets, mundis, across the state. It reduced the reliance of the grower on the non-local trader and almost halted the mandatory travels of the growers to outside markets, especially the Azadpur Mundi. Eight of the 13 functional mundis operate from Kashmir. 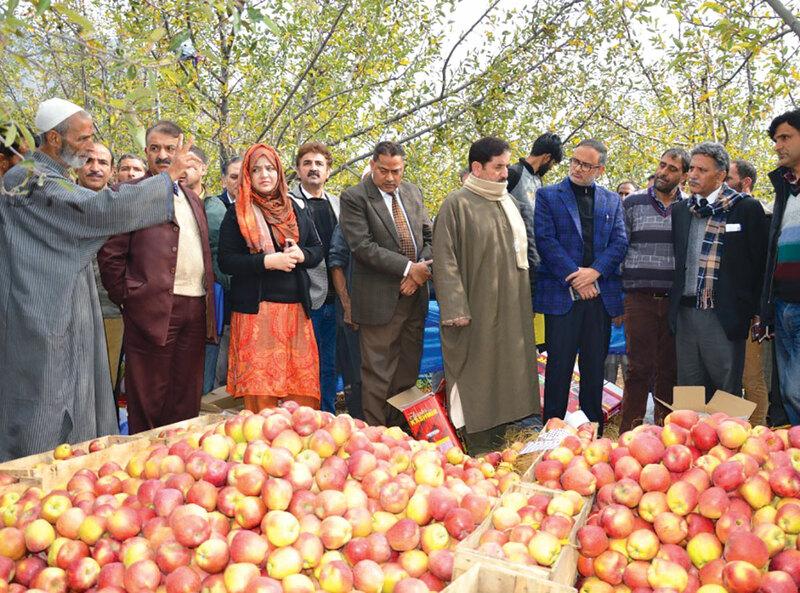 Bukhari said, by now, the records available with him suggest that 13 lakh metric tonnes of apple have crossed Lakhanpur, the state gateway, to various markets across the state. By March 2018, 1953769.92 tonnes of fresh fruit was exported to other states across India. Sixthly, the government involved banks and dove-tailed central government scheme to help implement controlled atmosphere stores in Kashmir. The capital-intensive projects were quite exorbitant initially and the growers had misconceptions about its use. The stakeholders directly engaged the growers and managed it in an astounding success. Though the FIL Industries pioneered the concept in Kashmir and in the mainland, it was Khurram Mir who popularised it and gave it a viable model. “It was a modest start,” Bukhari said. “Now we have 1.10 lakh metric ton CAS space in 22 units which is used entirely.” Though most of this post-harvest infrastructure is located in Lassipora (Pulwama), there are four units in north Kashmir. The most recent has opened in Pattan. Another is coming up in Achabal. The CAS network is crucial to denying the glut in Delhi and other markets to make apple, a buyer’s produce. It helps Kashmir sell its best produce off-season. Finally, the most revolutionary initiative took off – the form introduction of the high-density plantation. This initiative was waiting for a long time and all efforts to make it happen had failed, remember the introduction of Bulgarian varieties in the late eighties. Then, the government agencies managed the better saplings but forget the technology, and then they attempted getting technology but got bad apples, instead. This triggered disinterest among growers at a time when mass conversion of agriculture land into orchards was taking place. The high-density plantation is the only way out to improve the production (it has five-time yield against 10 ton per hectare of the traditional varieties), reduce the gestation period of the new plantations, have uniform international sizes and do away with colour variations. This is the only solution for making Kashmiri apple an export quality because this will fetch Kashmir almost 95 per cent of the A-category apple against prevailing 33 per cent. High density will make India (J&K controls 70 per cent of apple in India) No 2 apple producer in the world after China. Taking the initiative seriously, the Jammu and Kashmir government devised a policy and the JK Bank drafted a scheme. The government created benchmarks and clear strategy about how to go ahead. One pre-harvest entrepreneur who created the major demonstration plant deep South Kashmir – the same that was axed at the peak of 2016 unrest with the crop on the trees, was permitted to implement the 1000-kanals in the first year. The department also did almost the same size. The scheme is partly subsidised by the state government to make it popular. But the initiative has gone into the sluggish mode. Players in the field said the officials are discouraging and funds are lapsing. For creating high-density orchards on 240 hectors, Lone said, he has already placed orders with four private developers in Kashmir. “I want to issue orders for more land, maybe 200 hectares more,” Lone said. “But we will have to make efforts to reduce the dependence on imported rootstock by creating nurseries locally.” He said the government cannot perpetually support the initiative as the idea is merely interventional to create successful models. The imported rootstock requires quarantine for two years that could delay the pace, and the only way out is local nurseries. Personally, Lone said he is not supportive of entire orchard land conversion. “We have local varieties like Ambri that, if managed well, can give us as good yield as the HD gives,” he said. Advisor Khurshid A Ganai takes stock of the post-snowfall situation in Islamabad. These trees are completely a liability. “Repaired trees may survive, but will not be able to bear fruit for at least two to three seasons,” another grower in the belt said. “Maybe growers might have to ensure they do not bear fruit till they get properly fixed for the next season.” Even if half of the damaged trees will face this situation, apple production is neither going to be adequate nor better in quality, the growers believe. This situation is offering an alternative opportunity: why not replace these orchards in one go? This can be done in case of orchards which are completely decimated. The relief that the government is providing under SDRF is too small to make a change. The repaired trees are unlikely to compensate for the losses they have undergone, and they shall remain a recurring liability. Planting new traditional trees will take five to seven years to reach the level of the yield of the plantations they will replace. This will be a huge loss to the overall economy. The HD plantations have an inherent fifty per cent subsidy and the banks are more than willing to chip in. The government can add a bit of more subsidy in case of damaged orchards to help growers further instead of giving them petty bank cheques for Rs 1800, a kanal. The new plantations will bear fruit in the second year thus making a huge saving of time and production loss. The market is quite receptive to the idea. Businesses are barely working as the spending capacity has gone down. The past season has not brought impressive footfalls to the Kashmir meadows. Handicrafts are also down, and the traders have a huge inventory that has blocked the capital. If the governor Malik’s administration goes for a quick intervention, the market can improve almost instantly. In the last five years of informal high-density history in Kashmir, only four developers have emerged on the scene. If the apple orchard crisis can be converted into an opportunity, it has the possibility of tripling the number of developers through alliances and tie-ups. The growers are keen to opt for this option because, in the recent snowfall, the high-density plantations have suffered around three per cent loss because the dwarf, fragile trees lack a huge canopy and have stainless steel trellis system supporting it.